Manhattan Project National Historical Park - Super Inky! Hi everyone! It's me, Inky! I'm reporting from Los Alamos, New Mexico. Los Alamos is the home of the Manhattan Project National Historical Park because it's the birthplace of the atomic bomb. Atomic bombs are nuclear weapons, which get their power from nuclear reactions. Nuclear weapons are terrible, terrible things. The United States exploded two of these during World War II in Japan. "Little Boy" was detonated over Hiroshima, while "Fat Man" was in Nagasaki. Many, many people died and suffered from serious injuries and illnesses as a result. In fact, I want to be very clear that my trip to Manhattan Project NHP was not to celebrate nuclear weaponry, but to learn from it. The Manhattan Project park is actually made of three different sites. The one I visited is in New Mexico, but there are two others- in Hanford, Washington and Oak Ridge, Tennessee. The part of the park in Los Alamos is called Project Y. I went with my Mama and my grandma, Chi'i. I learned a lot about how the scientists and their support teams lived. The lodge in this picture is Fuller Lodge, which was used as a community center during Project Y. 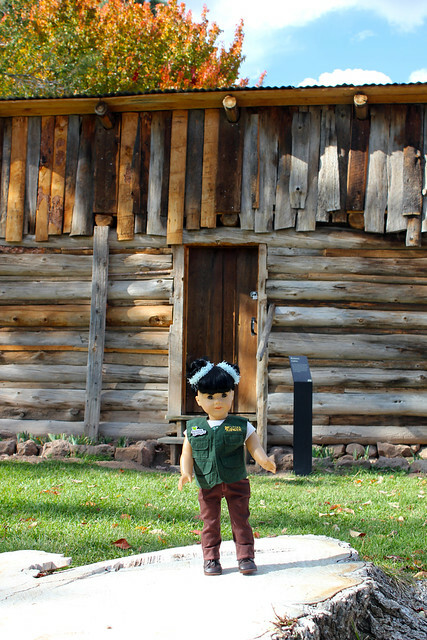 Near the lodge is an old cabin, the Romero Cabin, which represents the settlers in the area of European descent. It's one of three homestead cabins still standing. However, the first inhabitants of the Los Alamos area were the Ancestral Puebloan people. Mama, Chi'i, and that side of my family are modern Pueblo people! 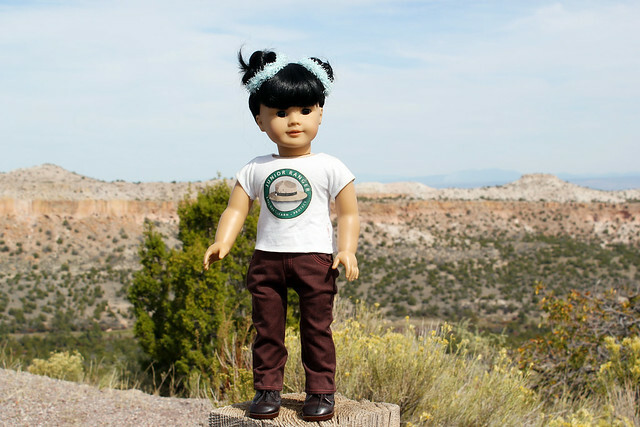 If you want to learn more about the Ancestral Puebloans from the Los Alamos area, click on this link to read about my visit to nearby Bandelier National Monument. There are remains of an Ancestral Puebloan site right next to the Romero cabin, but I didn't pose next to it out of respect. This is me in front of the Hans Bethe House. Hans Bethe and Edwin McMillan, who each won a Nobel Prize, lived in this house! It's going to be a museum soon. We didn't go in, but I posed in front of the flowers in the yard! 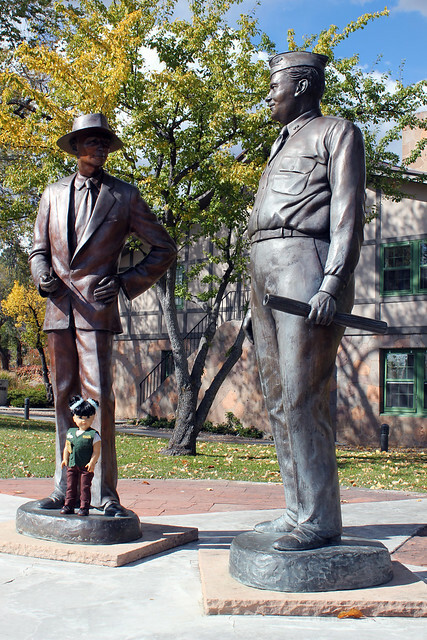 Here I am posing with statues of J. Robert Oppenheimer and General Leslie Groves. Dr. Oppenheimer was in charge of the scientific part of the Manhattan Project, while General Groves was the commanding general. Their work was very important scientifically, but again, we have to remember that tragedy that atomic weapons brought. Across the street from the statues, there is a little Visitor Center for the park. 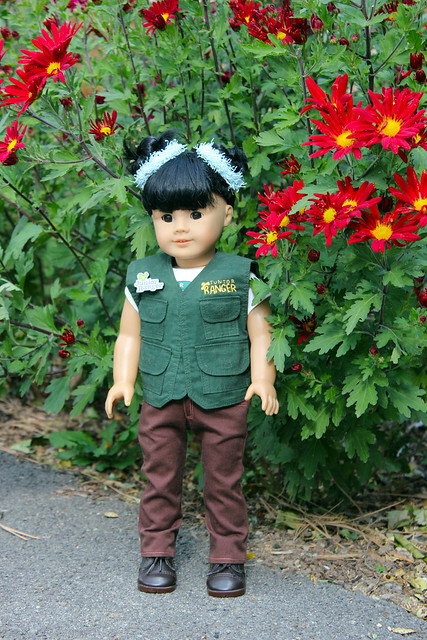 Whenever I visit a new park, I try to participate in the Junior Ranger Program. I got straight to work on my booklet! It was really fun to learn about the Manhattan Project. 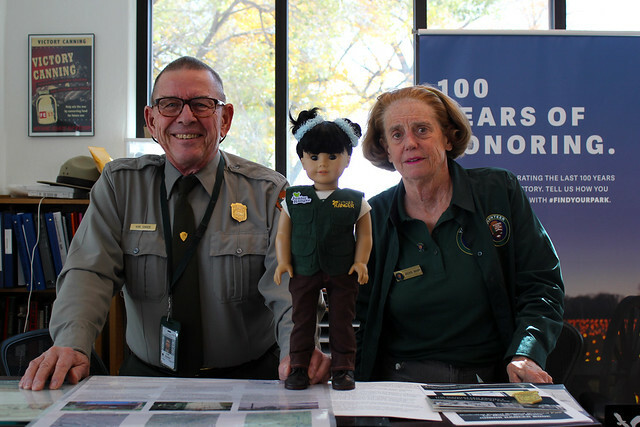 When I finished my booklet, Ranger Kirk and Volunteer Jackie posed with me for this photo and gave me a badge. They were interested in learning more about my family's Pueblo culture, so we were able to share knowledge between rangers and visitors! Cool! 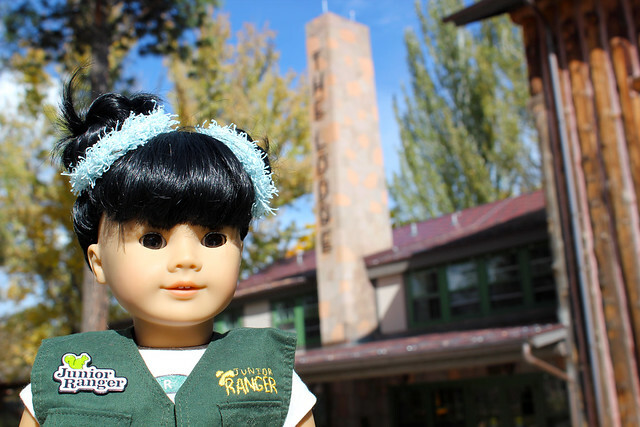 I recommended that they go down to Albuquerque and visit the Indian Pueblo Cultural Center. 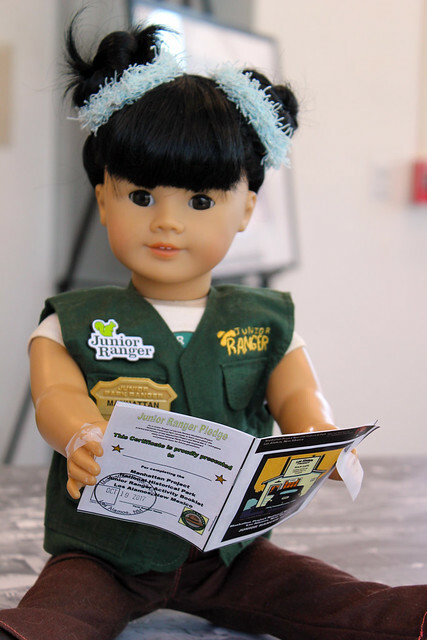 Meeting rangers and Parks volunteers is one of my favorite parts of visiting NPS sites! 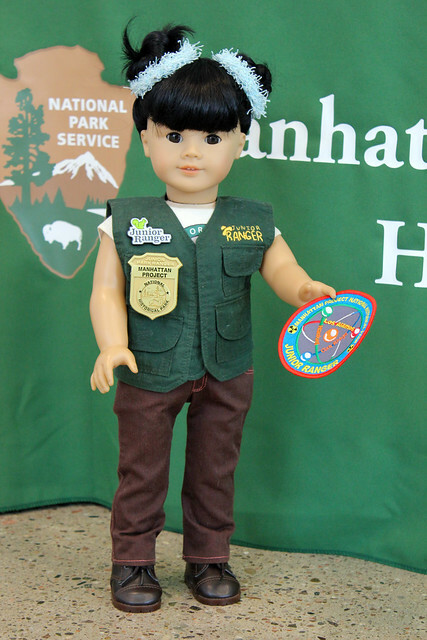 Junior Rangers at Manhattan Project NHP have the choice of a badge or a patch. I chose a badge, but the patch is awesome too! It features an atom and the names of all three sites in the Manhattan Project. Thanks for learning about the Manhattan Project with me! Remember- while atomic weapons are powerful, peace on Earth is the way to go! Looks like a wonderful adventure! Thank you for sharing your trip with us. My family hasn't been to New Mexico and you're helping us to see it. Thank you, again!